The Expense Management App, Walnut ran a 2 day ad campaign on Truecaller targeting customers effectively during Demonitisation, achieving 100 Mn Impressions & 55,000+ app Installs in just 2 days. With the backdrop of the demonetization in India, Walnut wanted to reach out to its target group to give them one more reason to use their app i.e. Locating an ATM with Cash. The expense management app wanted to reach out to its target customers during demonitisation in India & promote its Locate ATM with Cash feature. A plan was strategically crafted to reach out to consumers at the right place and at the right time using their mobile phones. 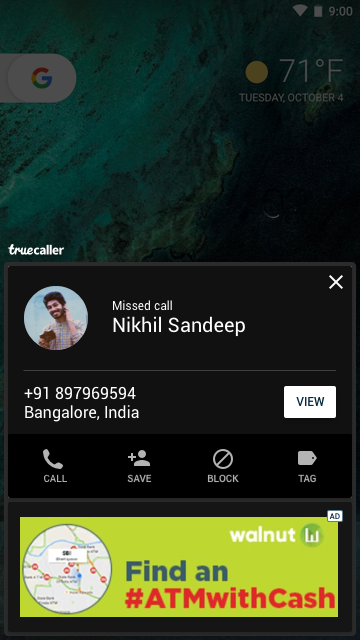 Truecaller provided the After Call Screen Roadblock solution during this campaign. This property on Truecaller gives exclusive attention and access to the intended target audience when they are highly engaged to their screens. This helped walnut get access to exclusive mind space at a phenominal 0.5% CTR. Reaching out to the target audience in a short span was possible on Truecaller due to the Brand Roadblock, that gives access to the most visible impressions on the platform. It’s a high impact property designed to deliver complete Share of Voice (SOV).